Cybersecurity is a concern for all businesses. Organizations from retail stores to financial institutions to healthcare providers must take measures to safeguard their computers and corporate IT networks. Chemical process industries (CPI) firms, indeed all companies that handle hazardous chemicals, must also ensure the integrity of their industrial control systems (ICSs). 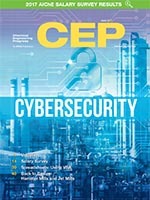 One article in this issue explains a matrix-based risk-assessment approach to determining how much security is enough. Another article presents prevention and mitigation strategies and offers recommendations for incorporating industrial cybersecurity into an existing process safety management (PSM) program. Other topics in this issue include the AIChE salary survey, spreadsheets: using VBA and hammer milling and jet milling fundamentals. Are you working in the right industry to make the most out of your chemical engineering degree? Ever wonder if other chemical engineers with the same experience level get paid more than you? Check out the results of AIChE’s biennial salary survey to find out which industry pays the most, how your salary stacks up to those of your peers, and the difference in salary between genders. Other factors explored in this year’s survey results include age, job function, supervisory responsibilities, and geographical location. Also, check out the benefits and health insurance packages being offered to chemical engineers. This is an expanded version of an article that appeared in the June 2017 issue of Chemical Engineering Progress. Industrial Cybersecurity: How Much Is Enough? To answer that question, first summarize potential attack scenarios in a matrix. Then identify which combinations of attacks, consequences, and risks require mitigation and which you are willing to accept. Excel includes a programming language that can improve your productivity, as well as the reliability of your spreadsheets. Simple programs in Visual Basic for Applications (VBA) can have a big impact on your work for little effort.